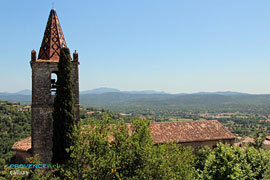 This village looks down on the plains between the Massif de l'Estérel to the south and the Pré- Alpes to the north. 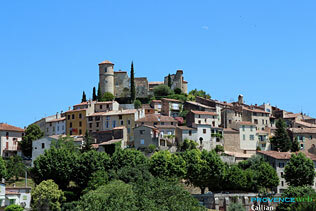 Having once been an important community, Callian boasts its own medieval castle perched high on the rocks, pretty homes, winding streets and flowered staircases. This village, well known for its calm atmosphere and envigoratoring climate is surrounded by hills covered with oaks and evergreens. It is starting place for many hikes and walks. One can enjoy swimming and boating in the lake St. Cassien. 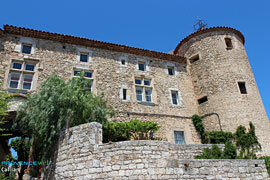 The Place Bourguignon is a refreshing stop with its waterfall and the neighboring esplanade offers a panoramic view at the plains and mountains nearby. 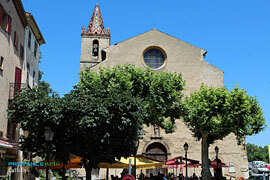 16th c. castle and its 12th and 13th c. towers, the 1685 church and its bell tower. Ancient chapels down in the plains. Hiking. Fishing and boating at lake St Cassien. 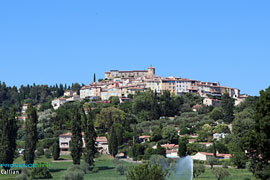 Montauroux (2 km), Fayence (9 km).